Welcome to Fab Five Friday. For those of you that are new to this blog, every Friday I showcase five blogs, websites or posts that I think you will enjoy. Today is all about free fonts. New changes coming to my blog so be sure to check back later today to see the new design!! 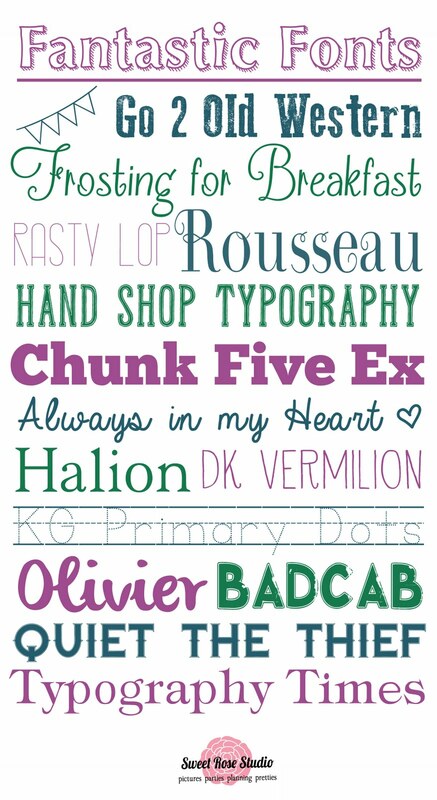 Be sure to click here to see 16 fantastic free fonts posted by Katie from Sweet Rose Studio. I am loving the Frosting for Breakfast font. Sounds yummy too! Speaking of free fonts, check out these stunning spring and Easter fonts posted on Thinking Outside the Sandbox. I love chocolate covered raindrops. Anyone else getting hungry? I am addicted to handwritten fonts so I did my happy dance when I found this post. I love the font Always Forever and can’t wait to download it. Be sure to check out A Subtle Revelry while you are there. It is a beautiful blog. Are you looking for some trendy new fonts? If so click here to you see these amazing fonts posted on the Smart School House blog. I so need the Cutie Patootie font! Now for my all-time favorite font source. You guessed it dafont.com. Many of the fonts shown above originated from this amazing site! I visit this site on a regular basis and love it! Be sure to check out the dingbats while you are there. I love cutting them out using my Cameo! The shapes are my favorite! Just downloaded Always in my Heart font. Love it, Thanks! I've been looking for some new fonts. Thanks for posting these! Love your Friday ideas! Thanks for sharing. Thanks for including us in your round up!